Flipper is a smart fish. Not only can he do my favourite trick of warding off sharks, but he also uses his sleep time with an effectiveness most new parents can only dream of. When sleeping, dolphins can’t afford the luxury of physically stopping for a kip. Instead they need to keep swimming, and crucially breathing, to stay alive. Scientists have found that they actually manage to switch off half their brain, so that the active part can control swimming and breathing, while the rest rests. Better than that, they team up in pairs to sleep, switching off the respective inner hemispheres (halves) of their brains, so that the outer halves are alert for predators, attack, Elijah Wood, Paul Hogan etc. 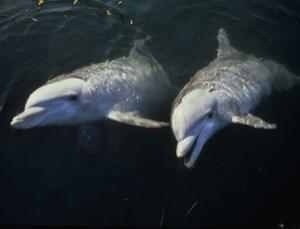 Check out this highly educational video offering rare insight into dolphins and their brains at work. Note, if you do not find this funny, we prescribe that you need more sleep.